Sky was a 10 year old intact female Border Collie. She had had her left eye semi-closed for the last few months and a several weeks history of lethargy. Ophthalmic examination revealed that her left eye was enophthalmic but visual, had upper lid ptosis and protrusion of the third eyelid. Her right eye, however, was blind, mydriatic and unresponsive to light. 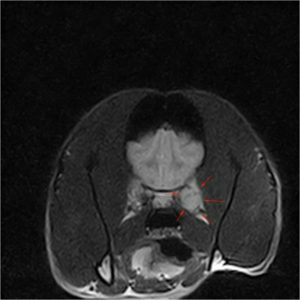 A lesion close to the optic chiasm was suspected and therefore a brain MRI was requested. There was a large mass at the optic chiasm which was isointense on T1 and T2 but showed marked well-marginated contrast enhancement. 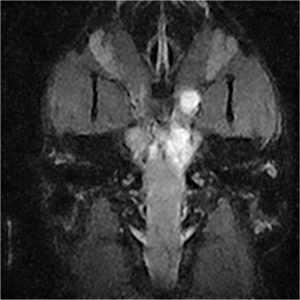 The mass extended rostrally from the chiasm along the left optic nerve for approximately 3.5cm. 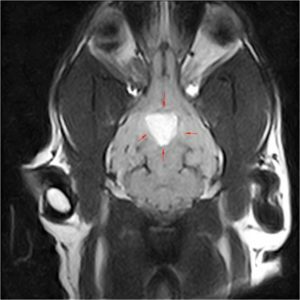 The left optic nerve had irregularly thickened with an approximate diameter of 8mm at its greatest. The right optic nerve was normal. 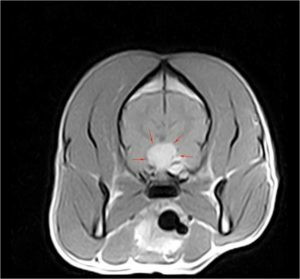 The MRI findings were consistent with an optic chiasm neoplasm (likely a meningioma) with extension to the left optic nerve. Differential diagnoses include granular cell tumours and lymphoma.